The 2014 REBSEA newsletter has two purposes. The first is to inform the reader of 'everything REBSEA'; its mission and the progress REBSEA is making towards accomplishing its goals. The second purpose of this newsletter is to illustrate the important role that REBSEA members are playing in their communities in advancing a new way for the business community to work with the nonprofit sector. Every institution and every industry must change with the times and adjust to the evolution of the societies they serve. The Non-Profit Sector is no exception. When government agencies and the best intentions of the world's wealthiest individuals fail to meet the dire needs of the those who are in pain and in need in our own communities, then new ideas are needed and that is precisely what REBSEA is.......A NEW IDEA ! 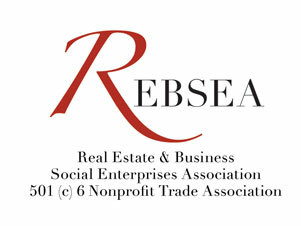 REBSEA was founded by 135 real estate agents, brokers, and lenders committed to Giving Back by supporting Non-Profit Organizations as part of the way they conduct their business. Most of our Founders have been donating a part of each commission to a NPO for years. After almost a year of research and development REBSEA was created to make this practice both easy and worthwhile for other real estate agents, brokers, and lenders to participate. Many of the hundreds of nonprofits that REBSEA members are already donating to and supporting are eager to direct their supporters to REBSEA members when they require real estate services. The idea is a very simple one; REBSEA Members work with the supporters of NPOs and with the increasingly socially conscious public when they are selling or buying a property. After closing our members make a donation to a NPO in their community. This simple idea has the potential to be a real game changer for NPOs and REBSEA members as well. The success of this plan is all but assured by another very simple concept; RE agents gladly and routinely pay referral fees of 25% of their commission to other agents for business that they otherwise would not have. So why would these same agents not make a donation to a nonprofit organization for business that they otherwise would not have? (And they can decide the amount). To further make the case for the REBSEA model are numerous studies which consistently demonstrate that approximately 85% of the public prefer to do business with people and companies that Give Back. On the strength of these simple yet powerful facts the second phase of the REBSEA plan was inaugurated by offering a Charter Membership to Realtors in every city and town where there is not yet a REBSEA member. The response has been enthusiastic and inspiring. We are approving new Charter Memberships each and every day. It is already clear that we will accomplish the goal of having a REBSEA member in most cities and towns across the country. Now that our Member Directory is published on our website, REBSEA is beginning the third phase of our plan; to drive traffic to the Directory and our REBSEA Members while working with NPOs to inform their supporters and the public that there now exists a network of RE agents, mortgage lenders, and other types of businesses who donate to and support NPOs in their community. This is Social Enterprise. It is an agreement between the public and the business community that they will support each other in a win-win arrangement. This is no different than the public giving their business to all types of companies that are responsible in their effect upon the environment and shunning those companies whose practices are harmful to the environment. And yes, we do mean "and other types of business" because the REBSEA model and plan begins with RE agents and mortgage lenders and soon will include other RE professionals, and will move in the direction of reaching out to ALL businesses who would like to have just such an 'arrangement' with the public. This is a bit down the road because we are first establishing a solid foundation of RE agents and mortgage lenders to lead by example and make this a common practice in business. Imagine if only 1 or 2% of all real estate transactions resulted in a donation of 10% of the agent's commission to NPOs..........do the math !! A GAME CHANGER ! !Now imagine if we have the infrastructure to help small businesses across the U.S. and Canada participate in this arrangement with the public. That is ultimately the goal of REBSEA and it is perfectly consistent with the content and predictions being taught in the MBA programs in all of our leading colleges and universities. They are incubators creating new models for social change and REBSEA is leading the way, beginning in the Real Estate Industry. Please join us ! Lead by example ! Be the change you want to see in the world !